The Smartthings outlet is as good as any… surprised they are out of stock. That hasn’t been the community experience in the UK, they were literally flameouts with the original model and it looks like it was discontinued and they are bringing out a new one but it’s not available yet. There’s a hive option which should work, but is expensive. Just checked, and hive has dropped the price by £10. Since the echo plus and smartthings use the same zigbee profile, I’ve been hoping that we would start to see more devices available. Salus Controls sell a ‘smart plug’ with model number SP600. On the face of it, it seems to be an energy monitoring plug using Zigbee ZHA1.2 and you can get it for £28 on Amazon UK or as little as £20 delivered on eBay. If it works with SmartThings it would almost seem rude not to buy one. Anyone encountered it? 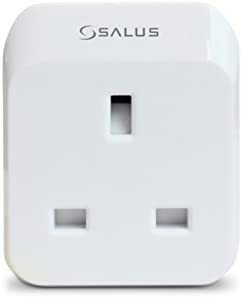 https://salus-controls.com/uk/product/sp600/ Thanks, G.
Smart Plug is a simple device that plugs into a traditional socket and allows powering the socket on and off to be controllable and ‘Smart’. @nezmo pointed out in another thread that the Amazon.co.UK link I had for the peanut plug was for the US model. My bad. Also, a couple of people have asked me for the link to the securifi peanut zigbee pocket socket, but I’m having trouble finding the UK version. If anyone has it please post it. Thanks for all the useful suggestions. I hadn’t spotted that the Hive plugs are zigbee - they should do the trick. I like the geek factor of the xbee, but is there any advantage over the Hive plug? Will the signal be stronger? Do these hive plugs work direct with SmartThings? I’m wanting a zigbee repeater as well. I’ve just attached a Hive Active Plug @Steveuk23 with no issue. Finds it as a “Thing” then just update it in the IDE as a Zigbee Switch Power. Bingo. And it does give you the power too. Here’s one way, but requires the purchased of a USB stick. Thanks I have been thinking about buying one of them to use with my Raspberry pi. Very tricky, but I think there is a quick way. If my Xioaomi button has connected to the Hive, and I power off the socket, I’d expect my Piston to be broken. I’ll give it a whirl, fingers crossed. Edit: Ok that didnt work, my only other way would be to power down the hub for a while, and try again. Xiaomi devices don’t conform to the Zigbee standard and AFIK won’t ever connect to a repeater… they only communicate directly with the hub. They connected to Ikea bulbs very well. I only know this thanks to a nightmare I had with the Xiaomi contacts and a couple of buttons (all in the kitchen). They connected to the bulbs whilst the bulbs were connected to ST. Mrs kept turning the lights off at the switch, and I’d lose the lot of them. So off ST they came, and connected directly to Hue instead. Took me a bloody age to get them all sorted again. That also goes for two of the buttons in the same area. I still get the nightmares from that one lol. Hmm so IKEA bulbs will repeat to the Xiaomi sensors? I’ve got 2 IKEA bulbs directly onto my SmartThings so might try moving one closer to my outside shed… As that’s where my sensor is that’s struggling with a connection. Ha ha know what you mean. Do you not use the smartapp "Simple device viewer"
If not I recommend it you can set up alerts so you get notifications when a device hasn’t reported back in however many days you want. I have a piston running twice a day and pushes out a message of either all online, or reports what is offline (more importantly ). But cheers, I’ll give that a whirl too. Simple device viewer? Whereto get that? Several community members report the IKEA Tradfri pocket socket is working well as a zigbee repeater. Note the plug style, though. Hi, have anyone connected the new ikea tradfri outlet?